The 2019 Innovation Contest is now accepting entries. The ASCE Innovation Contest was developed as a part of The ASCE Grand Challenge and is a springboard for forward-looking infrastructure ideas. The contest is an avenue to transform the way we approach, build and design infrastructure and brings together your best ideas, projects, and theories for how to build a better future. Now in its fourth year, the ASCE Innovation Contest has a track record of reaching a worldwide audience, delivering value to all participants, and attracting industry attention. Be part of the movement and share your innovation. Prize money will be awarded to each team or the individual winner of the following awards; the Overall Grand Challenge Award, the Best Entrepreneur Award, and the Best Student Submission to the 2019 ASCE Innovation Contest. For more details, create an account and download the contest documents. New opportunities may become available – many of our past winners received useful feedback, advice and sometimes new opportunities during their two days networking and meeting with industry leaders at the Contest Celebration Event. If you win, you are the best in that topic category across all types of submitters. 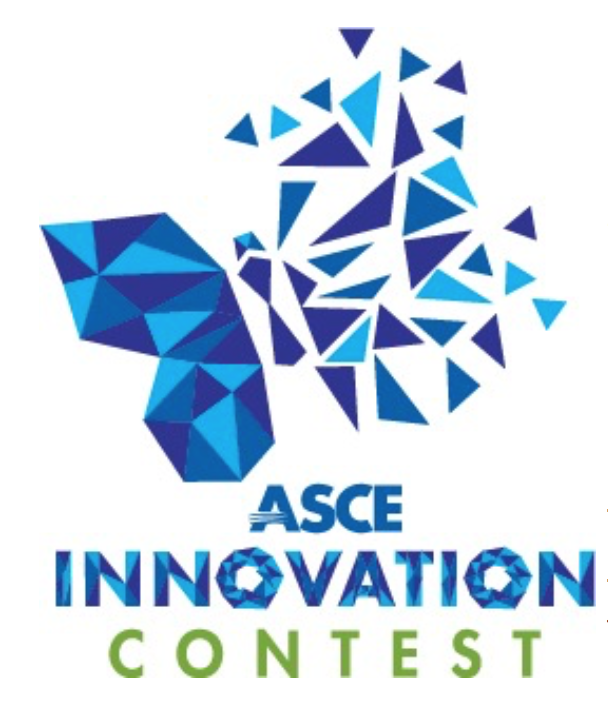 The ASCE Innovation contest is unique because it is open to anyone with a great idea in one of the six topic areas. Past winners include; undergraduate students, graduate students, professors, and industry professionals. Winning a topic category offers an expense-paid trip to ASCE Headquarters where you will present your innovation to potential investors and get feedback on your innovation from industry leaders and compete with the other six topic winners for the Overall Grand Challenge Award and prize money that comes with winning this award. If you are a student, the 2019 offers an Overall Best Student Submission Award that is only open to undergraduate or graduate students who are currently enrolled in a college level or higher academic program. The winning submission will be showcased at the Contest Celebration Event in June. descriptions for each topic area are available for download after you create an account on the contest site. An ability to communicate and articulate an idea. It is appropriate to question underlying assumptions presented by others who may have examined the problem if you are convinced a different perspective is appropriate. All things being equal, innovations with broad applications will generally be scored higher. In summary, we are interested in seeing how you think through the problem and a potential solution. Please contact innovationcontest@asce.org with any questions you may have about entering the 2019 contest. What is new about the 2019 Innovation Contest? The 2019 Contest will award prize money for the Overall Grand Challenge Award, the Best Entrepreneur Award, and the Best Student Submission. Learn more by creating an account. The Best Entrepreneur Award is also new to this year's contest. Are you an entrepreneur? Do you have innovative ideas in one of our six topic categories; Internet of Things, Sustainable Engineering, Next Generation Transportation, Improvements in Clean Water or New Construction Materials? And, if you have a great idea that doesn't fit into one of these categories, we have a new category titled, General Civil Infrastructure Improvement. If you have a great idea, please open an account and download the instructions and topic descriptions. We hope you will enter our contest and also enter your submission into consideration for the Best Entrepreneur Award. To be eligible for this award, in addition to entering a submission to one of the topics listed above, you must also enter a scalable business plan. Take a look at our student pilot efforts where we are working on broadening the scope and reach of the ASCE Innovation Contest for 2020 and beyond.